Free up space in your workshop and reduce setup times with A.W.T.’s Frame-Mate™, the handy solution for storing and transporting large, heavy, or bulky screen frames, pallets, or any rigid part or substrate. Built of durable steel and equipped with heavy-duty swivel casters, this mobile rack can handle wood, aluminum, or roller frames up to 50 x 60�? (127 x 152 cm) O.D., or even larger, depending on the shape. Use the Frame-Mate for post-curing storage of POP displays and other rigid substrates, increasing efficiency in your workshop. 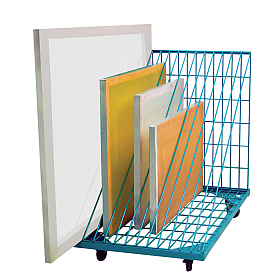 The Frame-Mate is also an excellent choice for storing pallets and pallet attachments. Shipping dimensions (LxWxH) 48.00" x 40.00" x 54.00"